Once again, the tumult of internal Afghan politics complicated both U.S. and Soviet jockeying. In the summer of 1979, Hafizullah Amin, a longtime ally of Taraki who became Deputy Prime Minister following the April Revolution, received word that Babrak Karmal (Daoud’s early supporter) was leading a Parcham plot to overthrow the Taraki regime. Amin took the opportunity to purge and execute many Parchamists and consolidate his own power. Complicating matters further, this internal strife damaged the Kabul Government’s major national program, namely, to bring the Communist revolution to the Islamic tribal areas beyond Kabul. By the winter of 1978, this program was met by armed revolt throughout the country. In response, Amin and Taraki traveled to Moscow to sign a friendship treaty which included a provision that would allow direct Soviet military assistance should the Islamic insurgency threaten the regime. This insurrection intensified over the next year and it became increasingly obvious to the Soviets that Taraki could not prevent all-out civil war and the prospect of a hostile Islamic government taking control. By mid-1979 Moscow was searching to replace Taraki and Amin, and dispatched combat troops to Bagram Air Base outside of Kabul. This move prompted the Carter administration to begin supplying non-lethal aid to Afghanmujahedeen, or Islamic insurgents. In August, a high-ranking Soviet military delegation arrived in Kabul to assess the situation. 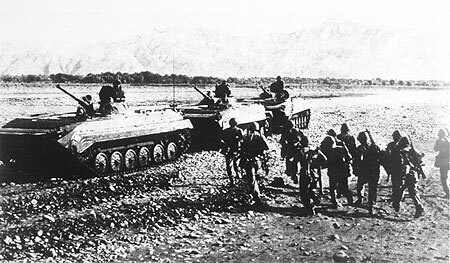 U.S. officials interpreted this mission as one last Soviet attempt to shore up the Taraki regime, and also an opportunity to devise a military takeover. Regarding the latter, most analysts in Washington believed that such a move remained possible but unlikely.